You’ve heard of vegetarianism. You know what a vegan is. You probably have even heard the term pescatarian (vegetarian who eats fish) too. But now there is a new term in circulation for describing diet habits: flexitarian. Here we will look at what exactly this new diet is and reasons why people are adapting it. Also known as a “semi vegetarian”, a flexitarian is a person who mostly sticks to a vegetarian diet but occasionally eats meat. The term goes back to the 1990s when the diet was seen as a way to popularize vegetarianism. Thanks to increased awareness about problems related to eating meat, we’ve seen a boom in vegetarianism over the past few years. In the US, it is estimated that around 7 percent of adults are now vegetarian. When you factor in the number of people who are mostly keeping a vegetarian diet, then the numbers get even bigger. Just look at the current trends: for the first time ever, we are seeing a decline in meat consumption in the US — a drop of 12% from 2007 to 2012 (source). 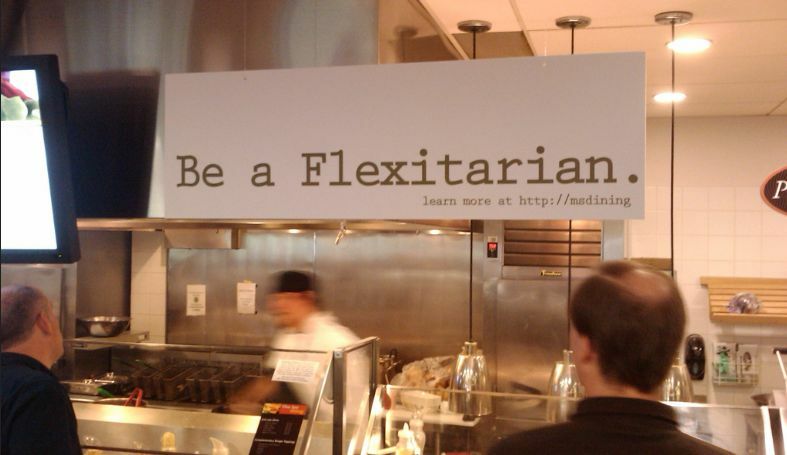 The idea of flexitarianism has become so mainstream that it was voted the “most useful word” by the American Dialect Society in 2003. In 2012, the term flexitarian was officially added to the Merriam Webster Collegiate Dictionary. So, a flexitarian is just a vegetarian who cheats? A lot of vegetarians have criticized flexitarianism as “vegetarianism with cheating” or “lazy vegetarianism”. Others critics point out that a flexitarian diet is the same thing as an omnivorous diet. But there is one key difference here: a standard US omnivorous diet is far from vegetarian. This generation eats more meat than Americans ever did in history. Americans today eat an average of 270 pounds of meat per year. Compare this to the 1950s when Americans ate just about 45 pounds per year (source)! So, a flexitarian diet is definitely different than the standard US omnivorous diet. As for the “cheating”, nobody is perfect. Even the most adamant vegetarians can slip up sometimes and accidentally eat animal products – like the time I ate a whole bunch of Planter’s sunflower seeds only to discover that they have gelatin in them (see these other products which are surprisingly not vegan). By calling yourself a flexitarian instead of a vegetarian, you are giving yourself more room to adapt your diet to the situation at hand. As a flexitarian, you don’t have to worry about feeling guilty if you decide to politely try your mother-in-law’s chicken cacciatore, or if you eat a burger during your vacation because you are tired of ordering salads. For die-hard vegetarians, a “flexitarian diet” might sound like the lazy way out. But, for many, it is a rational way of adapting to a vegetarian diet in a meat-lover’s world. A lot of people try to go vegetarian only to make a mistake or give in to temptation. They then let these failures ridden them with guilt and give up on vegetarianism completely. By going the flexitarian route, people pledge to do the best they can. Reducing meat consumption, even if not by 100%, is certainly something the animal-rights activists can support. Traditionally, the vegetarian diet has mostly been about animal rights. The fact that the vegetarian diet is associated with a slew of health benefits was just an added perk. But, as times change, increasingly more people are finding reasons to adapt a vegetarian diet and not all of them have to do with animal rights. It is these reasons which really make a flexitarian diet different from a vegetarian diet. Health: The vegetarian diet is associated with health benefits which include reduced risk of heart disease, diabetes, obesity, and some types of cancer. Weight loss: Because a vegetarian diet is higher in fiber and also usually lower in saturated fats, it can help people lose weight. Vegetarians have a much lower risk of obesity than people who eat meat. Read more about plant-based diet plans for weight loss here. Environment: It takes a lot of energy and resources to raise livestock and other animals for slaughter. The UN calculated that meat is responsible for 18% of the global climate change emissions. That is more than cars and all other forms of transportation combined! Save money: Meat is a lot more expensive than vegetables. One hypothetical calculation found that vegetarians saved $2.25 per day compared to meat eaters. See this post for a comparison of the cost of meat protein vs. plant protein. Should You Go the Flexitarian Route? Considering all of the benefits (both for health and the environment) of going flexitarian, there is certainly no reason not to give it a try. Plus, going veg is actually pretty easy because of how many meatless options there are now available in supermarkets and restaurants. You can start by making one meal a day vegetarian, or choosing to eat only veg once a week (like Meatless Mondays). As you get used to the change, you can start reducing your meat intake even further.